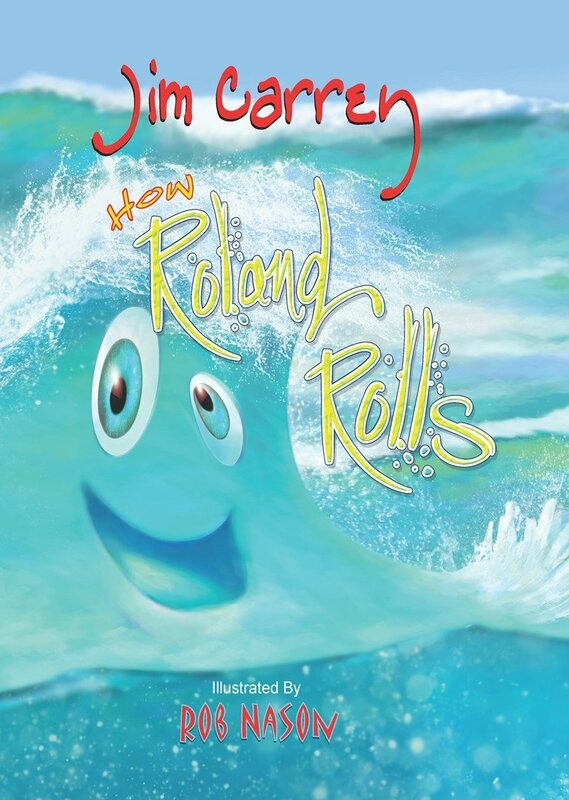 Jim Carrey has penned a story for kids titled How Roland Rolls about a scared wave called Roland. "I wrote a children's book. Because I just think, I want to be part of special moments for people and to me, there's nothing more special than the moment before bed when you're reading a story with your kid. That's one of those moments where it's just kind of a little slice of heaven when you're reading the story," he said. I like that he's involved in some many different creative things. I do that too and I'm not sure I have talent but I know for a fact that he does! Wish I could get the book. Call me crazy but I'm going to read that when it comes out I'm sure WalMart would have it. also can do the same . Being a good example is so important for the future generation our children and theirs,..so Jim is doing just that, like being a light of confidence standing up for goodness peace without fear of what others have to say, basically follow ur heart and everything falls into play. The Master @ Work! - To watch Jim unfold his vision for "How Roland Rolls", his first children's book, is to witness a master of creativity at work. Here, during a tele-creative session, Jim guides illustrator Rob Nason in how to create Roland's countenance. GATE founder John Raatz is leading and project managing the publication of "How Roland Rolls." I hope it reaches here! Great news about Jim Carrey's new book. It will be released on September 24, 2013. It is available to pre-order now and then you will get it already in early August. "How Roland Rolls" is a story about a wave named Roland who's afraid that, one day, when he hits the beach, his life will be over. But when he gets deep, he's struck by the notion that he’s not just a wave - he's the whole big, wide ocean! For children ages 4-8 and their grown-ups too! Hi, there! Jim Carrey here. I know you recognize me from a whole raft of fairly wacky movies ... and quite a few pretty serious ones, too. But I'm reaching out to you and your children now for a serious purpose. As a father and grandfather, I know there's nothing more important in our lives than the well-being and future success of our children and grandchildren. They are, in the most real sense, the future of our society. Indeed, the future of our global community. When I contemplate their future success, I'm not just thinking about their financial prowess in the world ­ though there¹s certainly a place for that. But rather, their success as human beings -- their ability to experience themselves as loved, loving, compassionate, empowered, and worthwhile. There¹s nothing more important than that. Indeed, it's the foundation for all the other successes in life ... the foundation for humanity's success in the world. How do we help our young people experience that kind of personal success? I believe it's directly connected to the quality of engagement and involvement we have with them. So many children today are suffering from their parents' busy lives, how much time and energy it takes just to provide for the family and keep the household working. Often, the kids are relegated to electronic games, TV, and surfing the Internet —­ all poor substitutes for parental involvement. I wrote How Roland Rolls specifically as a way for parents and grandparents to engage with children in quality together-time. Not only will the message of the story help them feel connected, worthwhile, and a part of something vast and grand ... the very act of you spending time simply to be with them, and only with them, will pay off in an experience of fulfillment that¹s truly beyond compare. I wish you happy reading. And even more importantly... happy together time! And the pics look so beautiful. It's a rhyming book so it's cool. I'm not sure I can buy it cause I don't know if they deliver outside USA but if they do. I will start saving money! this is true! I never forget when my dad read me bedtime stories! I love the cover i ordered 6 of them!!! I wonder how the printing, layout etc. how many pages are in the book?